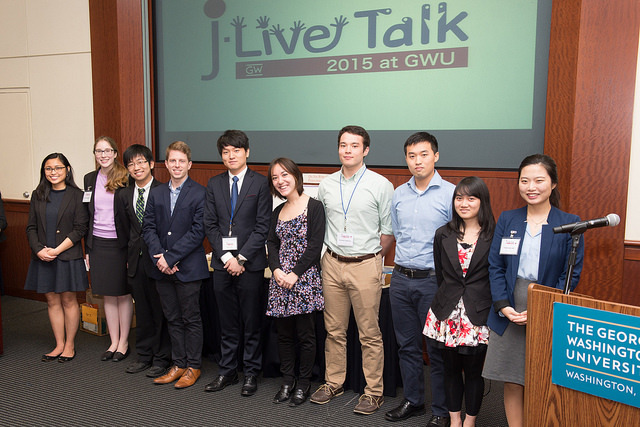 The first J-Live Talk, a new brand of college-level speech contest, took place on Sunday, November 8, 2015 at the George Washington University.With an emphasis on the 21st century communication skills, JLive (Japanese Learning Inspired Vision and Engagement) welcomed the use of audio-visual materials, audience interaction and other innovations to enhance the experience. Five judges including Minister for Public Affairs Masato Otaka of the Embassy of Japan evaluated the vision, dynamism, and level of engagement besides language proficiency. Students from Georgetown University, George Washington University, Johns Hopkins University, Johns Hopkins School of Advanced International Studies, Towson University and the University of Virginia were invited to compete in the final round of the competition. Described as “the most moving speech contest of all” by the special judge Dr. Seiichi Makino, Professor Emeritus of Japanese and Linguistics at Princeton University, in his closing remarks, the J-Live presentations were passionate and heartfelt with powerful messages. Mr. Danny Jeon (Johns Hopkins University) won the Gold award with an ANA round trip ticket to Japan, a six week summer intensive course at the Naganuma School in Tokyo and a stipend of $3000. Mr. Dunkin Adams (George Washington University) won the Silver award with an ANA round trip ticket to Japan, a six week summer intensive course at Nanzan University in Nagoya and a stipend of $1500. Mr. Ke Dong (George Washington University) won the Bronze award with an ANA round trip ticket to Japan. Ms. Chieko Quigley (George Washington University) and Mr. Kevin Yuan (Georgetown University) received Judges’ special recognition with a $500 cash prize. The J-Live Talk 2015 was made possible with generous support (in alphabetical order) from: All Nippon Airways, Embassy of Japan in the United States of America, iConnect’a, Japan Commerce Association of Washington DC Foundation, Inc., Japan Commerce Association of Washington DC, Inc., Japan Foundation Los Angeles, Naganuma School, Nanzan University, Sasakawa Peace Foundation USA, Sigur Center for Asian Studies, Dr. M. Tsunashima and Washington CORE. Finally, many thanks to the student volunteers from Professor Tsujioka’s class! Without their enthusiastic help, this event would not have been possible.